NEW DELHI: Lioli Ceramica has launched three new variants in the large format slabs under its flagship brand – TechnoSLAB. Introduced as Statuario Venato, Black Cosmos and Grey William, the slabs are shades of white, black and grey and have been inspired by nature’s designs that occur naturally in marble. The three products have been launched simultaneously for contrast décor applications. The milky white Statuario Venato with easy flowing, crisscrossing grey veins acts as the backdrop against which the Black Cosmos with dispersed presence of grey dabs and sprays along with the chalky Grey William work wonders as complementing surface covers. The newly launched designs can be cast across various kitchen applications. The Black Cosmos renders a perfect contrast for the countertop and backsplash; and the Grey William blends in smoothly as the dining top cover. The Statuario Venato as flooring becomes the canvas over which the rest of the ensemble sets befittingly. The technology used for printing the designs creates such immaculate impressions that it’s virtually impossible to differentiate the slab from a marble. 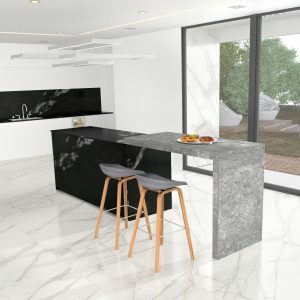 Other than this, the porcelain slabs are ten times harder than natural marble overcoming the limitation which marble poses for installation in high traffic or rough use applications such as in kitchens. Also, the large format slabs offer a seamless and continuous visual which only adds to the beauty of the space.